Senior Aaron Amare getting certified as a Martin Luther King Jr. scholar for participating in the conference. On January 19 and 20, a group of select Watkins Mill students attended the Martin Luther King, Jr. Global Youth Leadership and Social Innovation Conference at the University of the District of Columbia. 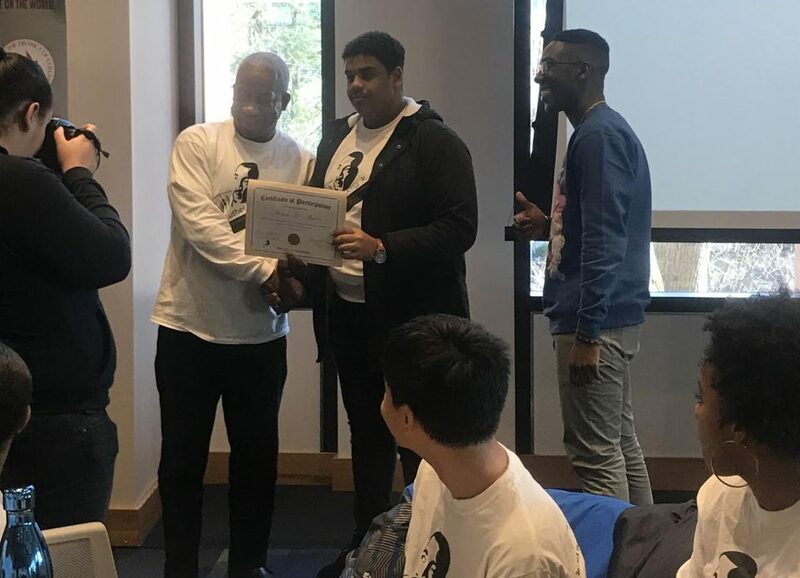 The University, which is ranked as one of the top ten HBCUs across America, hosted students from middle and high schools in DC, Maryland, Virginia, and Dubai. The conference was invite-only and students were selected through teacher recommendations for showing proficient leadership skills. Students were welcomed at the check-ins and promptly served breakfast. The ice was broken with a welcome speech emphasizing the significance and power of dreams. Attendees had the opportunity to get advice from founder of ScholarCHIPS Yasmine Arrington, CEO of MEANS Database Maria Rose Belding, and founder of Weird Enough Productions Tony Weaver Jr. during a panel. Students then split into small groups and reflected on their dreams and the changes they want to see in the world. During the workshops led by Arrington, Belding, and Weaver, students brainstormed solutions for a social issue of their choice. They received tips on mobilizing for a cause, team building, acquiring resources, and securing unconventional funding. “It was nice being around people from different schools, especially from overseas… I learned that no dream is useless and to strive to do my best when bringing mine to life,” junior Melanie Torres said. The most prominent issue presented in small groups was chosen to be presented in front of the entire conference. The group with the best presentation was awarded $500 to put their initiative into action. The two-day conference concluded with an award ceremony certifying participants as Martin Luther King Jr. scholars.